Inspired by worldwide travels and a plethora of ethnic textiles, including the quilts of the Amish and from Gee’s Bend in America, Japanese all indigo quilts, suzanis from the Caucuses, and Pakistani kanthas, Shots and Stripes answers the modern quilt community’s call for quilts that make bold graphic statements that are less time consuming and complex than some of the work for which he has been previously celebrated. 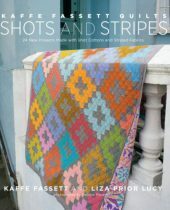 While still serving his core audience of long time devotees and celebrating his and their passions for vibrant colour, Fassett is introducing himself to a new generation of quilters with the types of projects they’re currently seeking. First published by Stewart, Tabori & Chang (Abrams, US) in 2013.